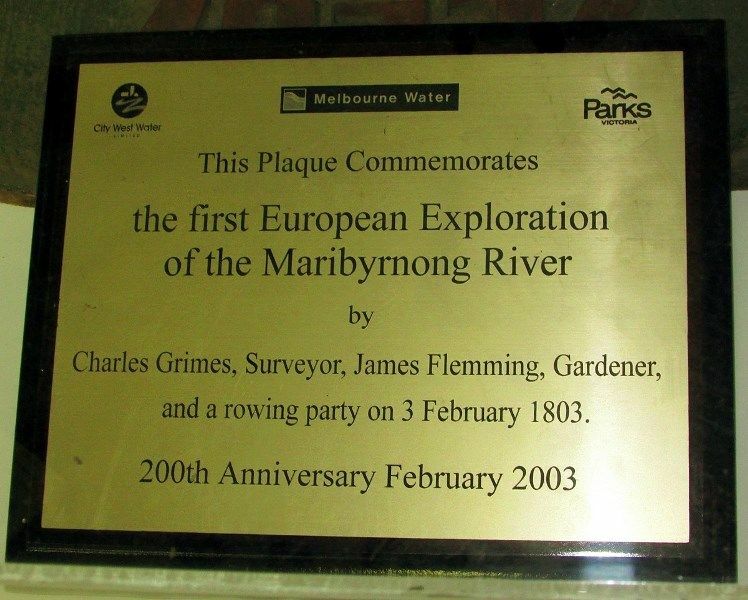 A plaque commemorates the first European Exploration of the Maribyrnong River by Charles Grimes and party in 1803. The plaque was unveiled on the 200th anniversary. The first non-Aboriginal people to explore the Maribyrnong arrived in 1803. The New South Wales Governor, Phillip King, had sent a surveying party headed by Charles Grimes, aboard the Cumberland, to watch two French ships exploring Bass Strait. Grimes’ party also explored Port Phillip Bay, making landings at several points and rowing up the Maribyrnong River as far as present-day Avondale Heights. Here they noted an Aboriginal fish trap at a ‘rock falls’ across the river. and a rowing party on 3 February 1803.